Hey yogis! 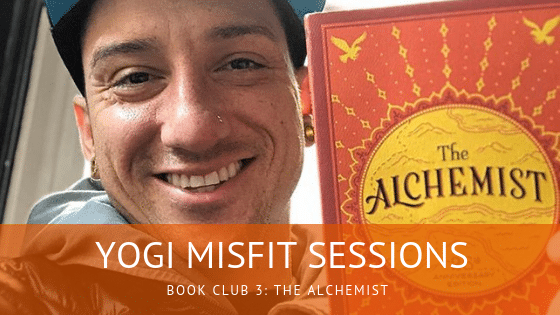 By now, we’ve finished reading book #3 of the Yogi Misfit Book Club, The Alchemist. If you haven’t yet finished it–no worries! Keep on keepin’ on but there are spoilers ahead! This session, I talk about the story of the Alchemist. If metaphorical stories or self-help books are not your jam, this book will not be for you. The Alchemist is a novel by Brazilian author Paulo Coelho. Originally written in Portuguese, has become an international bestseller and has been translated into over 65 languages. As an allegorical story, The Alchemist follows a young Andalusian shepherd named Santiago in his journey to the pyramids of Egypt, after having a recurring dream of finding a treasure there. Some things that stood out to me were following your dreams with a sense of responsibility and how love should always be supportive. The biggest thing that really struck me was also about being in the present and in the moment, going through the process that will get you towards your end goal. Stay tuned for the next book, The Life Changing Magic of Tidying Up by Marie Kondo. Buy it here. Keep up with all book club-related things here. See the group for details on the live discussion of The Alchemist. You’ll be joining the rad kula (community) that is the Yogi Misfits. Liforme – Check out their eco-friendly, non-slip Yoga mats that have been produced to provide you the best foundation for your Yoga practice. Use code ‘DANNIP2019’ to get 10% off your order. Liforme: Check out their eco-friendly, non-slip Yoga mats that have been produced to provide you the best foundation for your Yoga practice. Use code ‘DANNIP2019’ to get 10% off your order. WRITE A REVIEW If you like the podcast, please leave a review or rating on iTunes! Click here for a quick and easy guide on how to leave a review on iTunes.